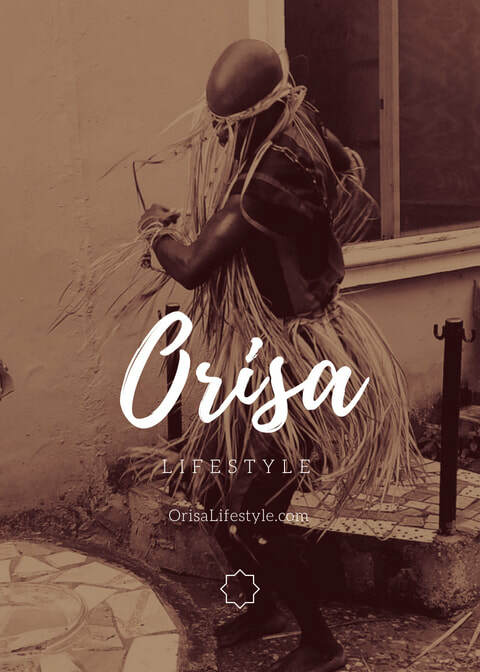 ORISA LIFESTYLE NIGERIA TOUR 2019: ONLY 8 SPACES LEFT!!! We will travel to Lagos, Abeokuta, and Osogbo to support our spiritual development and cultural immersion. In each kingdom we will have lectures/workshops, participate in specific ceremonies, visit historical sites and Yoruba markets with knowledgable guides. Few places stir passion the way that Nigeria does: the breathtaking beauty of Abeokuta's rocky hills, the birthplace of Yemoja, the serene stillness of the Osun River, the mosaic tin roofs of Ibadan, and the slave dungeons of Badagry all reveal the timeless beauty of Yoruba heritage. The Babalawo's hypnotic recitation of Ifa chants and the quiet prayers of Olorisas in their personal shrines all reflect how religious devotion runs through every facet of life here in the land of the Orisa. In Nigeria, Orisa Lifestyle is all-pervasive. It is embedded in the land, the rivers, the trees, the flora and the fauna. The brilliant fabrics, savory foods, as well as the elaborate festivals all bring the tradition to life in uncountable ways. Join us as we celebrate the wonders of Yoruba tradition with world class teachers, priests, artists and everyday people. Visit the Yemoja River (Oogun), one of Abeokuta’s holiest sites. Explore her mysteries through Cuban, Brazilian and Nigerian perspectives. Accompanied by an expert guide, who is well-versed in the local tradition, walk up to the Olumo Rock to see its sacred shrines and learn about its significance to the Egba people, who sought refuge under the rock to escape the horrors of slavery. In Osogbo, stop at the holiest sites in the Osun Grove and listen as your guide unravels their deep, esoteric meanings. Approach the Osun River and marvel at the stunning peacefulness of her gentle flow. This is where Orisa lives majestically and increases in power every day! Q- How much money will I need for the entire trip? A- If you register by Dec 1, the total cost is $2950, which includes R/T travel, food and lodging. If you budget $400 for spending money you will be fine. Q- Are children allowed on the tour? A- We LOVE children... BUT, the minimum age is 18. Q- How do I check the latest foreign travel advice? Q- Are there luggage limits? Personal item: Your personal item must not exceed 18 x 14 x 8 inches (45 x 35 x 20 cm ). A backpack, for example. Check in item: Your check in CANNOT exceed 22 x 14 x 9 inches / 56 x 36 x 23 centimeters (including handles and wheels). Must fit in the sizer at the airport. Q- Are there health precautions to consider? ​A- Some vaccines are recommended or required for Nigeria. Check out Passport Health for more information. Q- Are there passport requirements? A- It is your responsibility to ensure that your passport is valid for travel to Nigeria for at least 6 months after 7/25/2019. It is also your responsibility to comply with all tour requirements for acquiring a valid visa for Nigeria, and that all necessary vaccinations for Nigeria are in order. Q- Has the VISA application changed? ​A- YES! Visit OIS to get updates!!! Day 1, July 11: Lagos - Arrive in Lagos and transfer to hotel. Meet and greet. Dinner with Chief Lanre and EGBE AMUFAWUNMI. 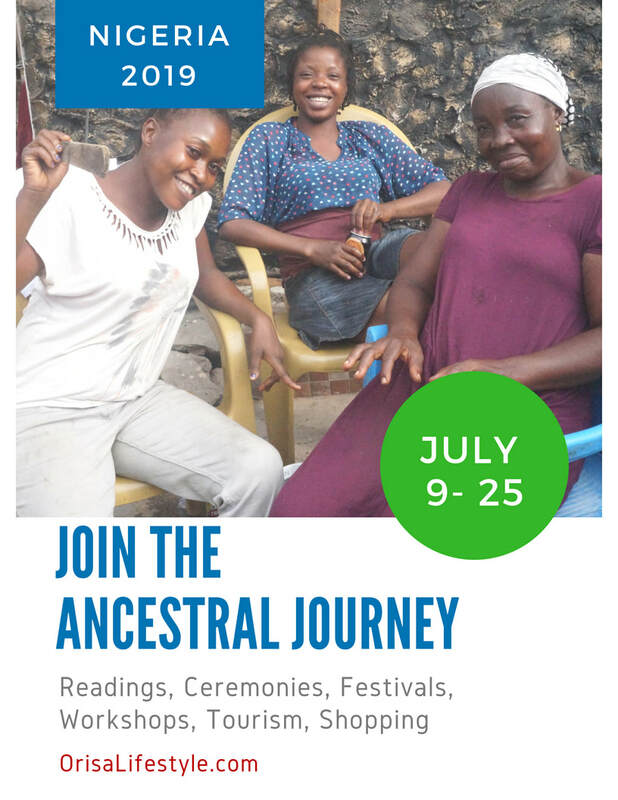 Day 2, July 13: Lagos - Make offerings and prayer, begin spiritual work, including personal IFA FESTIVAL. Day 4, July 15: Lagos - Complete spiritual work. LAGOS to ABEOKUTA. Visit ancestral shrines. Begin personal IFA FESTIVAL. Day 5, July 16: Abeokuta - Walking tour of the city, including Olumo Rock and the King's Palace. Day 6, July 17: Abeokuta - Walking tour of the city, including traditional adire (indigo tie dye) studio and the Yemoja River. Day 7, July 18: ABEOKUTA to OSOGBO. Begin personal EGUNGUN FESTIVAL at the OGBE OLA TEMPLE. Visit Ose Meji Palace. Day 8, July 19: Osogbo - Yoruba language and culture lectures, continue spiritual work, visit the fabric market, invite tailors for clothing. Day 9, July 20: Osogbo - Yoruba language and culture lectures. Day 10, July 21: OSOGBO - LAGOS.